Specifying a reliable resource for healthcare casework is of prime importance. With everyone in the construction industry being stretched, specifying the right casework system that adheres to project specifications is critical. From sustainable construction and solid surface materials to acquiring LEED points, the pressure is on to specify the right choice for end users. It is difficult to sort through the variety of options for healthcare casework brands in the marketplace today. Few manufacturers provide the transparency to allow an “apples to apples” comparison of product. This creates confusion in the marketplace and presents challenges to specifiers and contractors who want to recommend the right product for an end user. This market confusion has necessitated the creation of extensive casework mockup evaluations for projects adding additional time for evaluating potential casework product. To minimize the above issues and provide a more comprehensive solution, ASST has now partnered with TMI Systems as a dealer for their line of healthcare casework. Based in North Dakota, TMI is a leader in high quality laminate modular casework fabrication. Their sustainable modular casework products feature railmounted overhead cabinets and forward-thinking reconfigurable base cabinets. With Autodesk 3D BIM software, design professionals are able to thoroughly document planning decisions in drawings used in the approval process. With cutting edge computer 3D renderings, end users can understand the proposed designs even better. With the new ASST/TMI alliance, design professionals are providing solutions that can truly evolve with end user needs. Let us assist you with your next healthcare casework project! Whatever you need, ASST can build it to your exact specifications, in a safe manner, and to the quality standards you expect. Contact us now online or call us at 717-630-1251. This desk is being fabricated using a laminate base, Corian solid surface top, aluminum stand offs with 3Form decorative blinds. This is a combination of Corian solid surface and laminate. Designing fixtures that are a combination of solid surface and laminate is a great way to create keep your project in budget and everlasting. The planning of renovations to laboratories can be time consuming, expensive and disruptive to end users. Most academic institutions and corporate research organizations respond to the legitimate demands of individual researchers to make improvements. Qualified laboratory design architects and engineers need to provide valuable advice on casework to achieve good performance and flexibility for the future. Sometimes because of capital budget constraints or convenience, facilities engineers only treat the symptoms. They sometimes lose sight of the causes that can adversely affect the health of all occupants. For example, poor ventilation and chemical leaks/spills can corrode metal laboratory casework. Rusty hinges and hardware can create safety issues. Cabinet shelves and doors can fall and create additional chaos. Once chemicals have corroded metal casework shelves, they are almost impossible to keep clean and can create hazardous conditions. To minimize the above issues, ASST has now partnered with TMI Systems as a dealer for their line of casework. Based in North Dakota, TMI is a leader in high quality plastic laminate modular casework fabrication. Their modular casework products feature rail-mounted overhead cabinets and forward-thinking reconfigurable base cabinets. 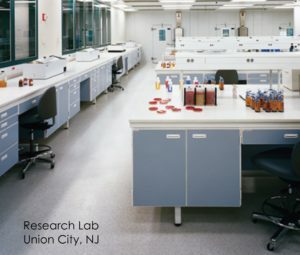 Laboratory planners and engineers can now specify casework that can achieve good performance and flexibility for the future. With Autodesk 3D BIM software, design professionals are able to more thoroughly document planning decisions in drawings used in the approval process. With cutting edge computer 3D renderings, end users can understand the proposed designs even better. With the new TMI/ASST alliance, design professionals are providing solutions that can truly evolve with end user needs. Let us assist you with your next lab casework project! Whatever you need, ASST can build it to your exact specifications, in a safe manner, and to the quality standards you expect. Contact us now online or call us at 717-630-1251. In both healthcare and education projects, flexibility is a prime concern. Design professionals are often being asked to utilize casework products that incorporate modular features. Features that allow casework to be reconfigured to meet the evolving needs of healthcare and educational end users. Design professionals need a reliable casework resource to address these design challenges. Most casework today is manufactured for a permanent installation. Even with an AWI Premium or Custom grade casework, cabinets are not usually designed to be reconfigured. This puts a huge constraint on the design professional who needs to provide for future end user flexibility. Reinstalling casework that is not meant to be reconfigured can cause product damage and may even void the casework warranty. To minimize the above issues, ASST has now partnered with TMI Systems as a dealer for their line of casework. Based in North Dakota, TMI is a leader in quality plastic laminate and wood modular casework fabrication. Their modular casework products feature rail-mounted overhead cabinets and forward-thinking reconfigurable base cabinets. With the new TMI/ASST alliance, design professionals can now provide solutions that truly evolve with end user needs. With newly created Autodesk BIM models for all cabinet types, all of the specifier tools are available to facilitate the design process. Because of ASST’s depth of experience, we can provide a wealth of knowledge for your next casework project. We can share creative ideas and best practices on incorporating solid surface into your next project. 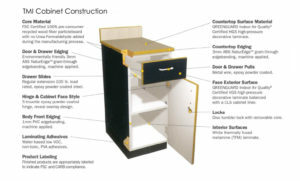 Whether you are looking for solid surface vanities or plastic laminate casework, ASST can help. We can provide you with the project inspiration and technical details to make your project a success! Solid surface is beginning to be specified by more design professionals for interior classroom educational environments. Durable exterior materials for schools are usually brick masonry. Today, we see an evolving similar logic with solid surface interior surfaces. Durable solid surface is gaining strong momentum in educational interior applications because of it’s demonstrated lasting value. 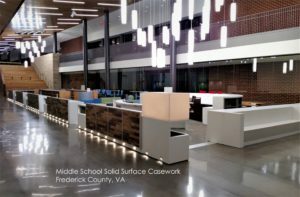 School districts are seeing the wisdom of utilizing solid surface on the interior to future proof their buildings. Design professionals struggle with balancing surface material design, budget and performance characteristics. Class A fire rated solid surface materials are ideal for educational classroom environments. Both the antimicrobial properties and ease of cleaning outperform lesser quality surfacing materials. Unfortunately, solid surface can be easily value engineered out of a project. It can be substituted by plastic laminate which has a shorter lifespan and lacks any antimicrobial properties. 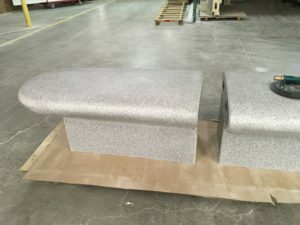 Many solid surface fabricators are unable to provide project information on lifecycle costing to help design professionals make a strong case for keeping their solid surface educational project specifications intact. ASST is able to assist design professionals with information on project lifecycle durability and performance. Our educational project history can provide an experienced voice for a wide variety of applications. From vertical surfaces to casework and countertops ASST can help. For twenty years, we have provided design professionals with relevant information to support your vision. We invite you to contact us for your next education project! Future proof your next solid surface educational project with ASST! Whatever you need, ASST can build it to the exact specifications, in a safe manner and to the finest quality standards you expect. Contact us now online or call us at 717-630-1251. Solid surface countertops and vertical surfaces continue to be popular when durability and maintenance are a high priority. It is only natural that design professionals and end users alike now want that durability in casework. 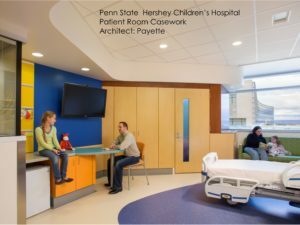 Healthcare and public spaces require solid surface fixtures that can withstand the rigors of heavy use. 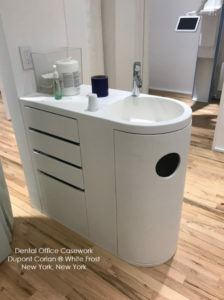 Design professionals have found though that specifying casework with solid surface can be a budget balancing act. 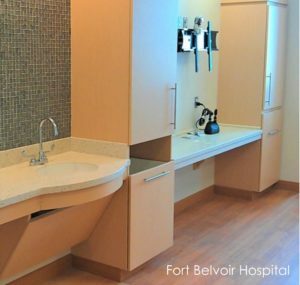 Solid surface seems to be a “value engineering” item even on large healthcare projects. 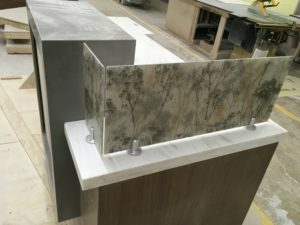 Although solid surface countertops may remain on a project, the end result unfortunately is that the actual cabinet is changed to a plastic laminate surface. Thankfully solid surface manufacturers today are continuing to innovate. For example, Avonite ® Surfaces manufacturers an 1/8” “skin” material that can be wrapped around casework boxes made with FSC certified wood fiber materials. Suitable for only vertical applications, these “skins” provide enhanced performance and help with infection control when used in healthcare settings. We have found value in providing a more innovative comprehensive solution for our customers. ASST has now partnered with TMI Systems Corporation as a dealer for their line of casework. Based in North Dakota, TMI is a leader in quality casework fabrication. They are an excellent reputable resource and ASST looks forward to working with them on many future projects. With this new alliance, ASST can perform work with wood veneers, plastic laminate, Trespa®, stone, metal, glass as well as all brands of solid surface and resin plastic materials. Our innovative team of estimators, planners and project managers collaborate and deliver project results in a way few competitors can. We look forward to working with you on your next project! First impressions always count. 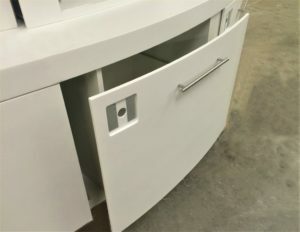 Be sure to call us for your next solid surface casework project! Whatever you need, ASST can build it to the exact specifications, in a safe manner and to the finest quality standards you expect. Contact us now online or call us at 717-630-1251.